"A tale of adventure and an unlikely friendship on one of California's last ranchos. In fourth grade California students study the state's history including the missions and ranchos. However, few tales from this period have been written down. 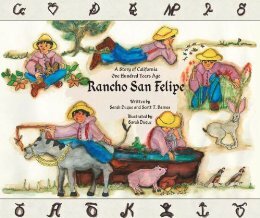 Rancho San Felipe is a true story of a 1905 adventure told by the daughter of the hero. Woman-of-the-year winner Sarah Duque's delightful full-color illustrations make this true story equally appropriate as a fourth-grade reader and a read-aloud book. Includes a map, vocabulary, and brands used to identify cattle." I spent a couple of years of my childhood living in California and remember our times of learning about the history of California including the ranches and missions. This book is a fantastic, historical look for students today to capture some of that history in beautifully illustrated story form. Sarah Duque tells the true story of her Father Victor as a child in 1905 as he heads out on his first cattle drive. He wants to be a vaquero or cowboy in the worst way, and learns many skills along the way. Victor thinks a tall horse and a pair of boots will make him a vaquero but it really ends up being the skills he learns along the way as he encounters different wild animals and people. The illustrations are in fantastic California style! They look like native Hispanic drawings and really show the lifestyle and life on the ranches. The colors are bright and engaging. This is a great book to have on hand as you learn state history, or the lives of people in early California. A great addition to a homeschoolers library. Looks like a fun and educational book for children that would hold their interest. The illustrations look wonderful. Enjoyed your review! looks like a wonderful book!